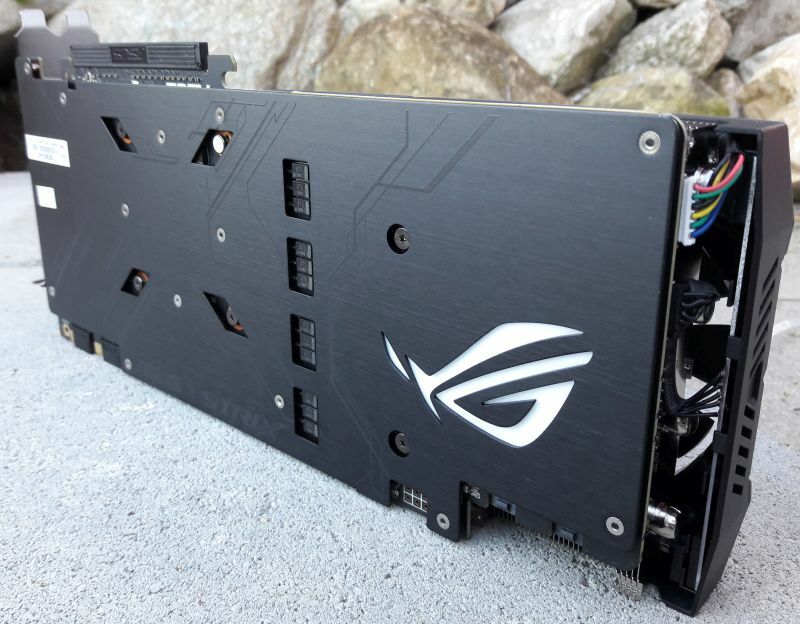 This GeForce GTX 1080 is the flagship member of the ROG Strix family. The reference GTX 1080 comes with a GPU clocked at 1607MHz (base clock) and 1733MHz (boost clock). 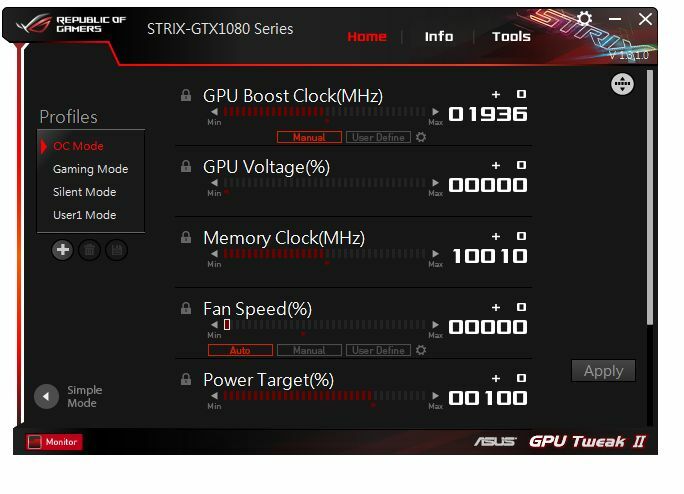 These clock speeds are too low for ASUS who has overclocked the GPU at 1784MHz (base clock) and 1936MHz (boost clock). 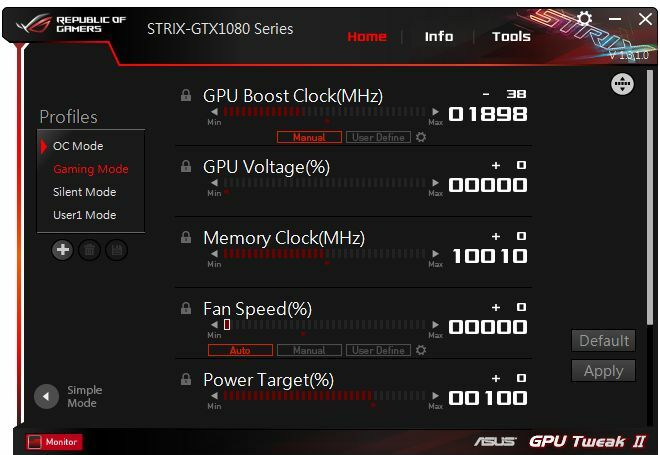 The Strix GTX 1080 comes with a factory overclocking of +11% (or +203MHz). This out-the-box overcloking involves more power consumption. 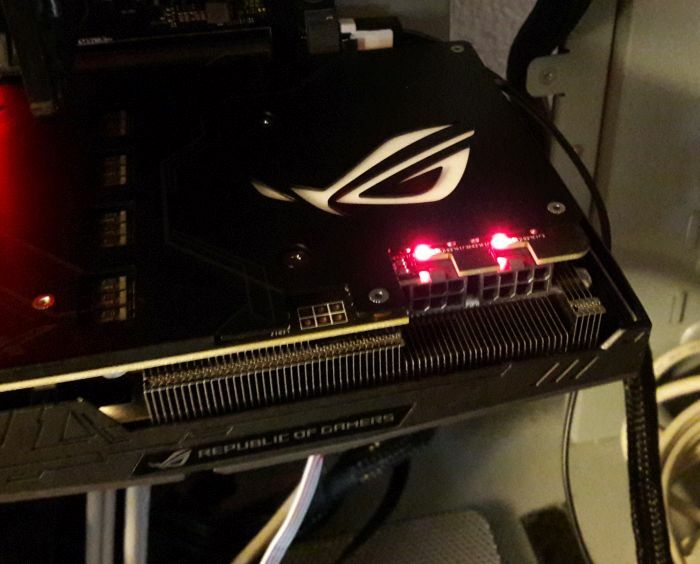 That’s why the Strix GTX 1080 requires 8-pin + 6-pin additional power connectors (there is only one 8-pin connector on NVIDIA reference board). 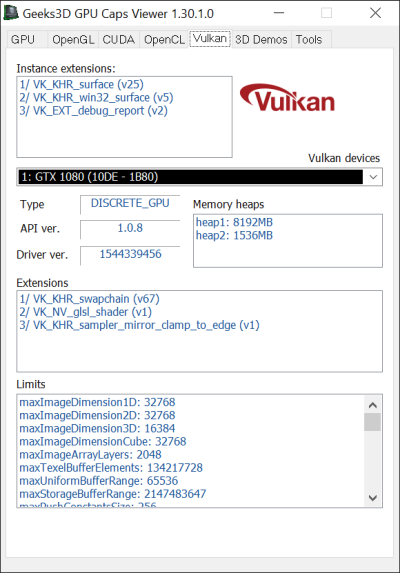 The 8GB of GDDR5X graphics memory are overclocked with a small +10MHz: 10010MHz (effective speed) against 10000MHz for the reference board. One the geeky features that most of the GTX 1080 have in common is the RGB lighting on the VGA cooler. 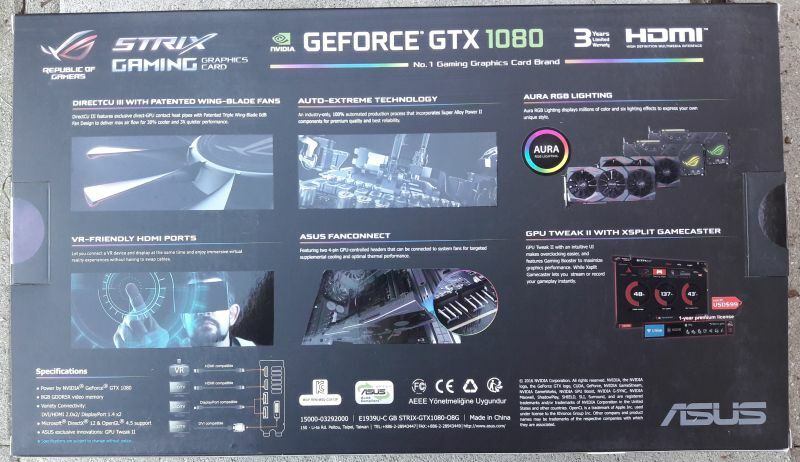 In this field, the Strix GTX 1080 comes with the Aura RGB Lighting to control the lighting effects of the card. 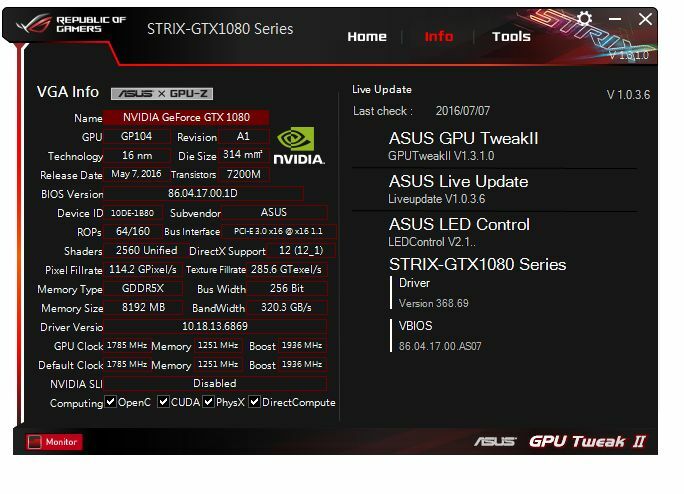 The homepage of ASUS Strix GTX 1080 can be found HERE. All photos have been taken with a Samsung Galaxy A5 2016 mobile phone. The Strix GTX 1080 is equipped with the DirectCU III VGA cooler which features triple 0-dB fans. When the GPU temperature is below a threshold, the fans are stopped resulting a fully quiet graphics card. 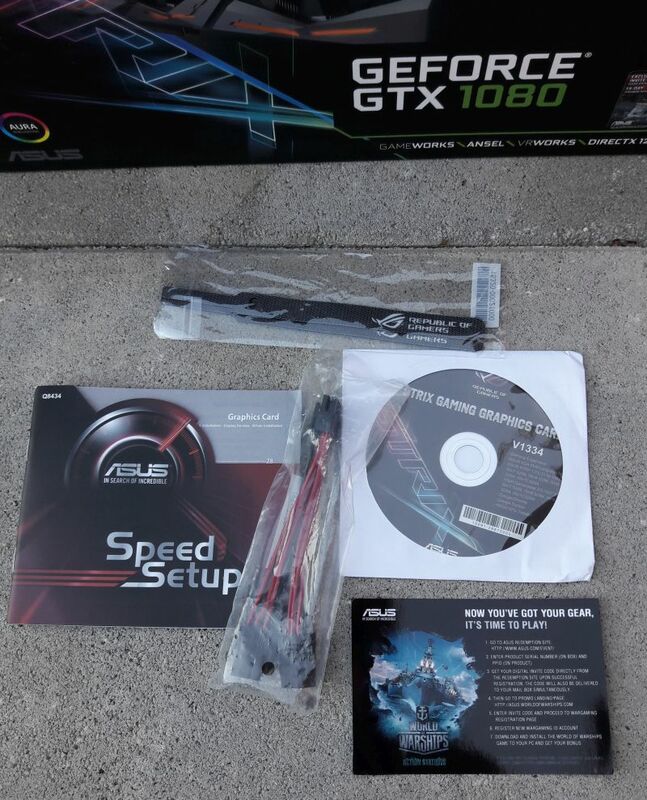 The card includes two connectors for driving PC case fans. The case fans are synchronized with VGA cooler fans. The card support 2-way, 3-way and 4-way SLI. But 3-way and 4-way SLI are disabled. 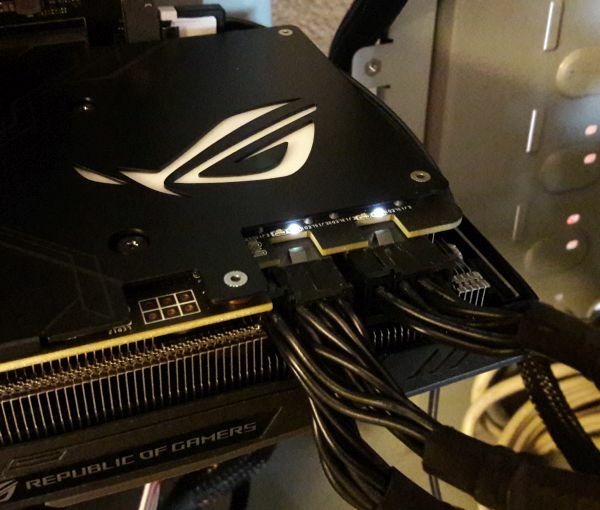 The user has to request an Enthusiast Key for SLI setups with 3 or 4 GPUs. 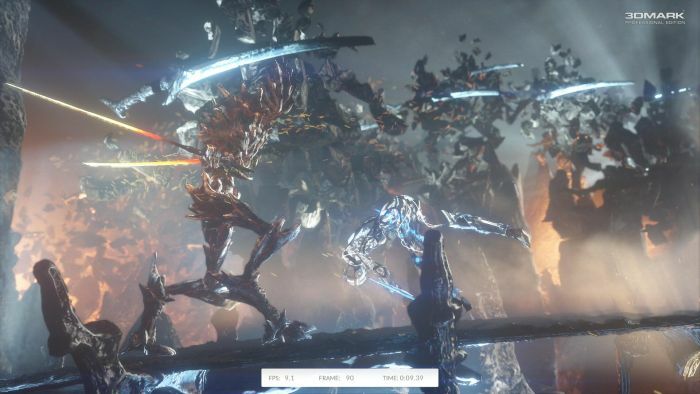 Fire Strike is a Direct3D 11 benchmark for high-performance gaming PCs with serious graphics cards. 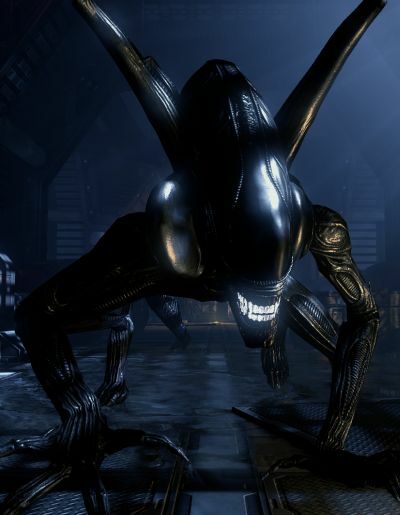 Alien vs Predator (or AvP) is a Direct3D 11 benchmark with tessellation and high quality shadows. AvP can be downloaded from this page. Settings: Resolution: 1920 x 1080, Texture Quality: 2, Shadow Quality: 3, Anisotropic Filtering: 16, SSAO: ON, Vertical Sync: OFF, DX11 Tessellation: ON, DX11 Advanced Shadows: ON, DX11 MSAA Samples: 1. 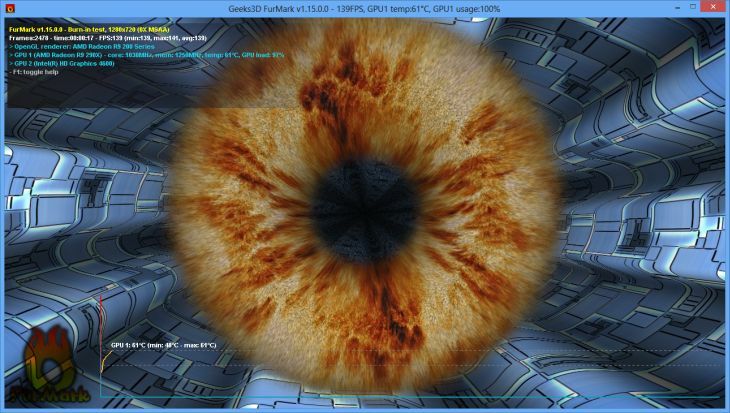 This quick burn-in test has been done with Geeks3D FurMark 1.17 and ASUS GPU Tweak 1.2.16. The GPU power target of the Strix GTX 1080 can be set from 46% TDP to 120% TDP. 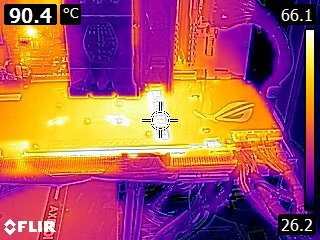 The first thing to do before the burn-in (same thing applies for overclocking) is to set the power target to the max: 120% TDP. 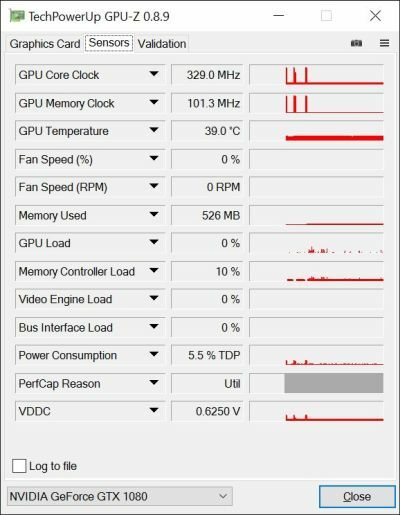 At idle, the total power consumption of the system was 44W and the GPU temperature was 46°C. And the noise? 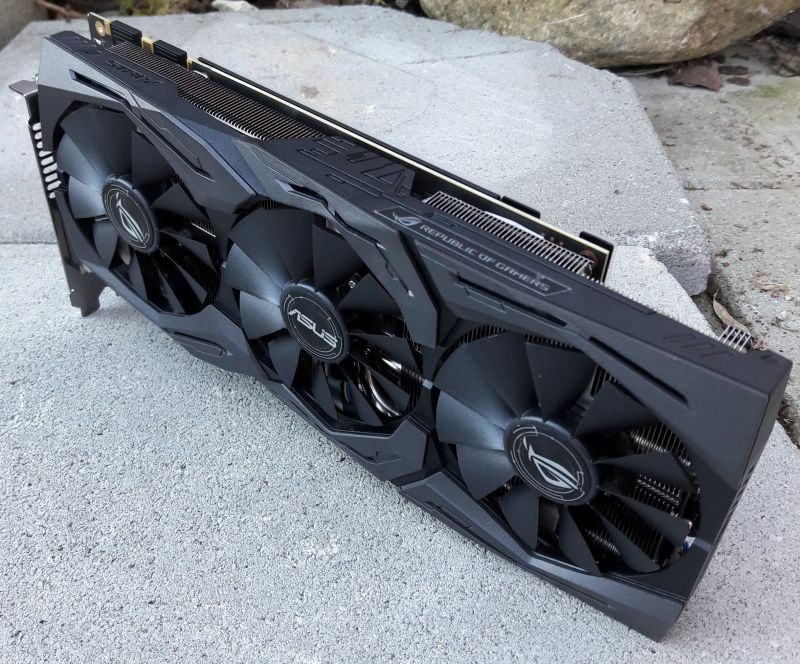 At idle, the Strix GTX 1080 is noiseless because VGA cooler fans are stopped. 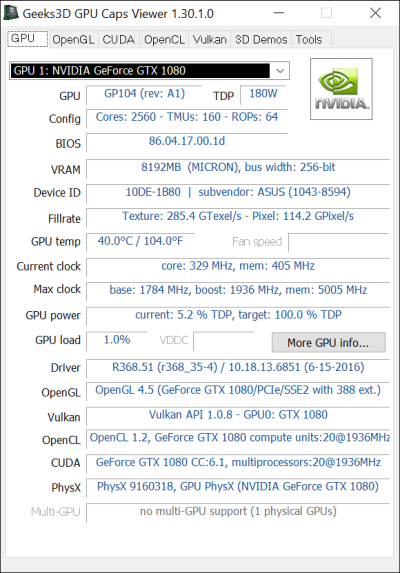 I launched FurMark in stress test mode in 1024×768 and after 5 minutes, the GPU temperature reached 75°C while the total power consumption was 304W. where 0.9 the the power efficiency factor of the Corsair AX860i PSU. The GTX 1080 reference board has a TDP of 180W (100% TDP). 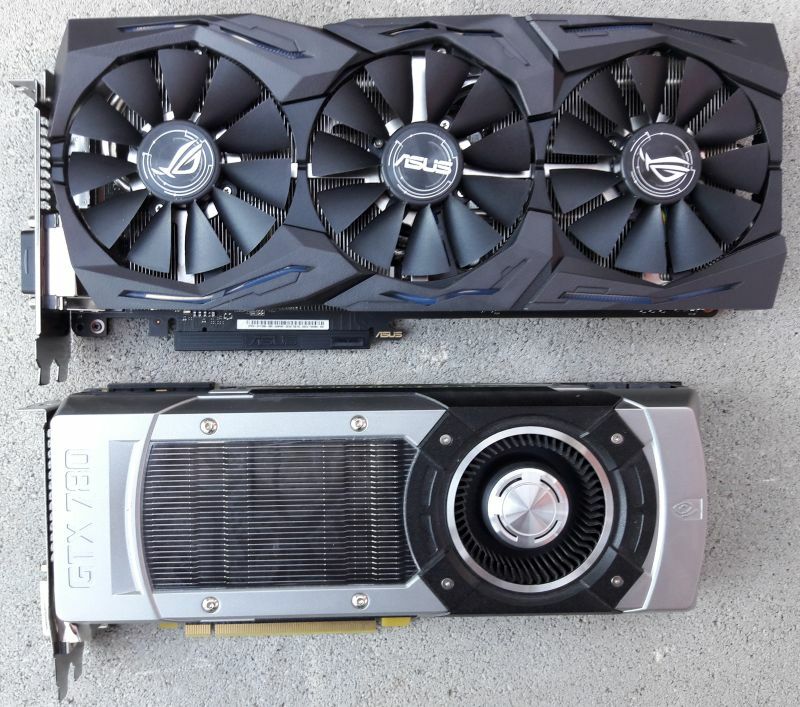 A GPU power of 116% TDP is equal to 212W. Since the Strix GTX 1080 is overclocked, 216W of maximal power consumption should not be too far from the real value. 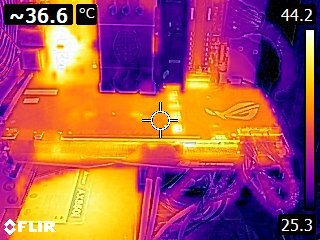 At 75°C, the fan noise was really reasonable (41dB measured at around 50cm from the graphics card, open case). Another important fact: there is no throttling! 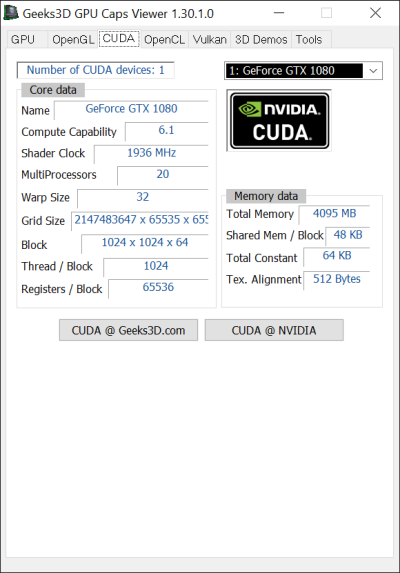 Each graphic card maker has its own GPU overclocking and tweaking utility. 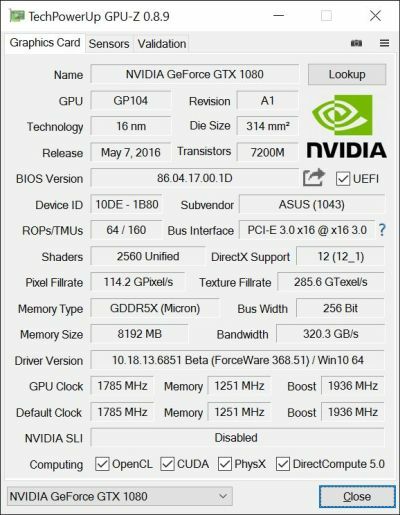 MSI has Afterburner, EVGA has Precision and ASUS has GPU Tweak. 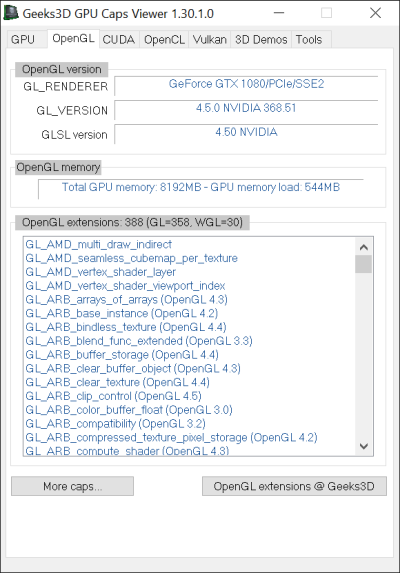 The latest version of GPU Tweak II can be downloaded from Geeks3D download zone: GPU Tweak II v1.3.1.0. 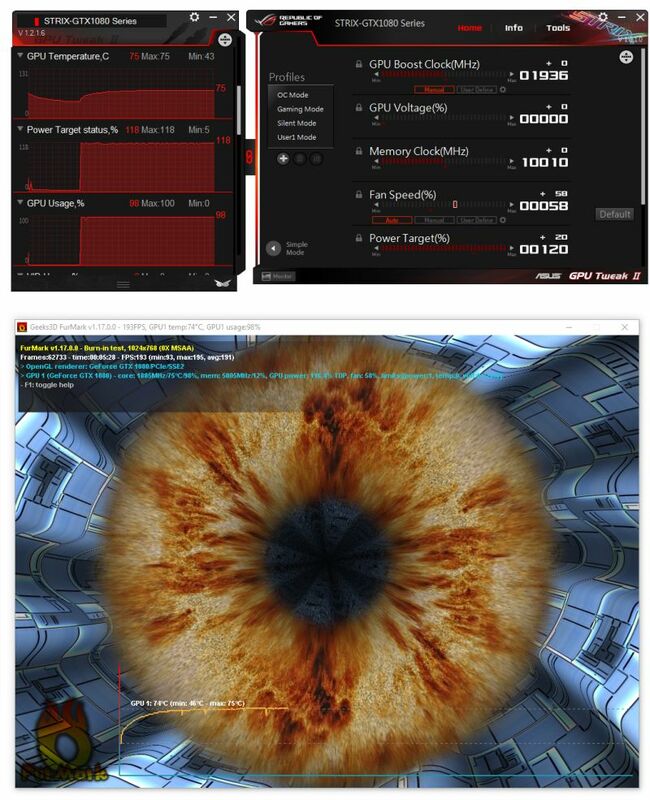 Thanks to GPU Tweak you can set the power target, the GPU core clock offset, the GPU voltage offsert, the GPU memory clock, GPU temperature target. 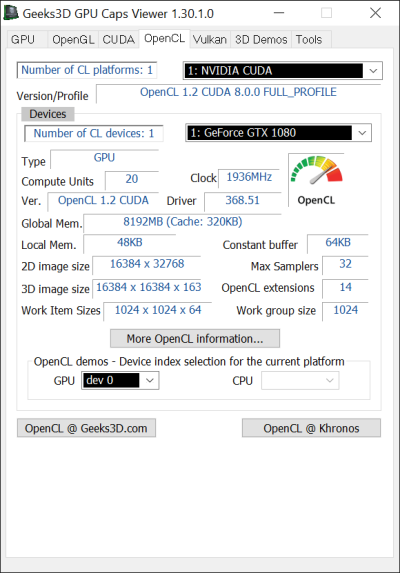 GPU Tweak also includes several profiles: OC Mode (max settings), Gaming Mode and Silent Mode. 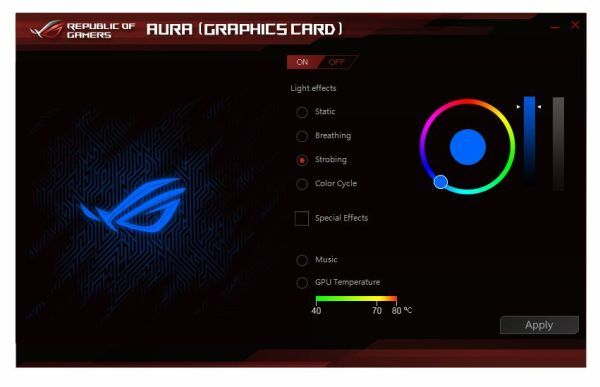 AURA works fine but as a graphics developer, I would have liked to find a simple SDK to program myself the RGB lighting. 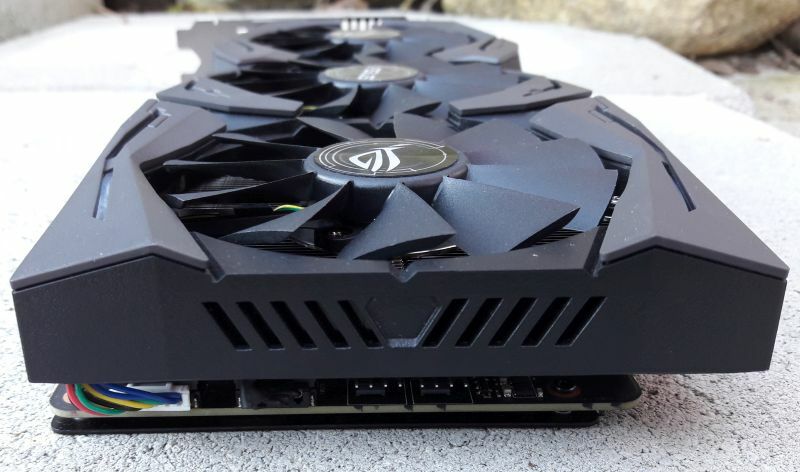 NVIDIA offers such kind of functions in the NVAPI for the GeForce GTX led logo. 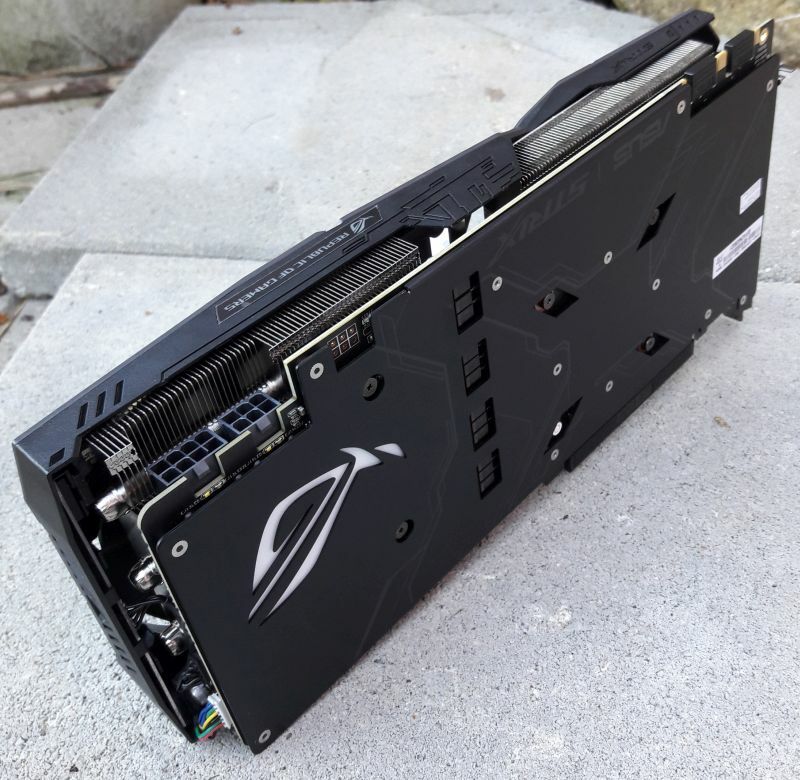 ASUS ROG Strix GTX 1080 O8G GAMING is a really nice product. 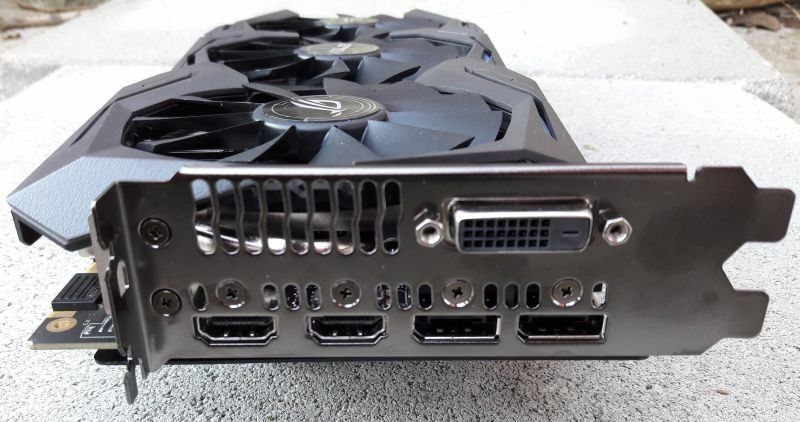 This card has a nice backplate, quiet VGA cooler (noiseless at idle thanks to the 0dB fans technology, fans being stopped while you are working on desktop applications or browsing the Net, while under full load the VGA cooler noise is very acceptable) and customizable RGB lighting on the VGA cooler shroud as well as on the backplate. There is no GPU core clock throttling, the VGA cooler does a good job by keeping the GPU temperature under 76°C under heavy load and the 8GB of GDDR5X graphics memory offer enough place for gaming at WGHD resolutions (2560×1440) and even at 4K resolutions (3840×2160). 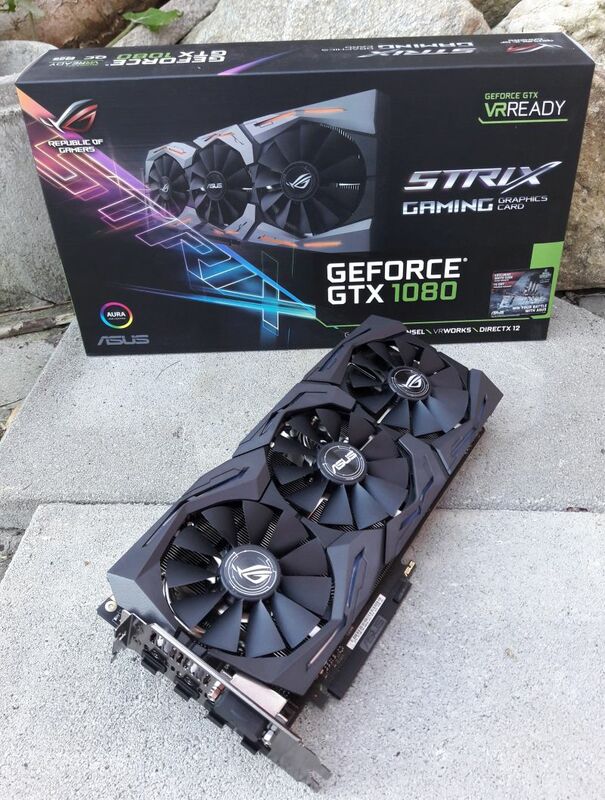 What’s more, the Strix GTX 1080 comes with one of the most factory-overcloked GPU on the market (boost clock: 1936MHz). 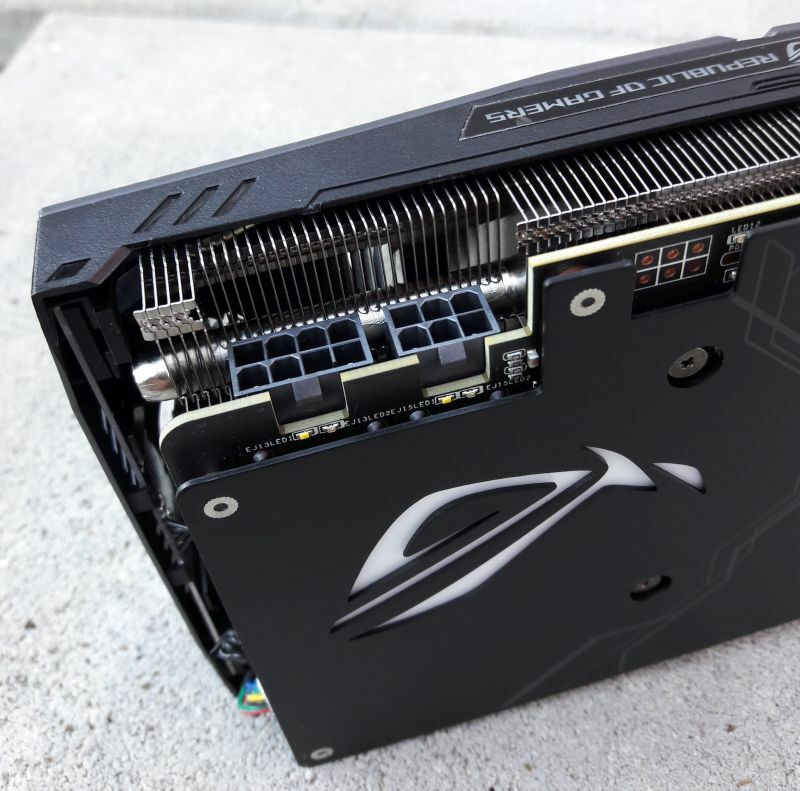 The board includes two connectors (ASUS FanConnect) that allows to plug two case fans in order to improve case cooling when GPU is under load. The case fans are synchronized with VGA cooler fans. 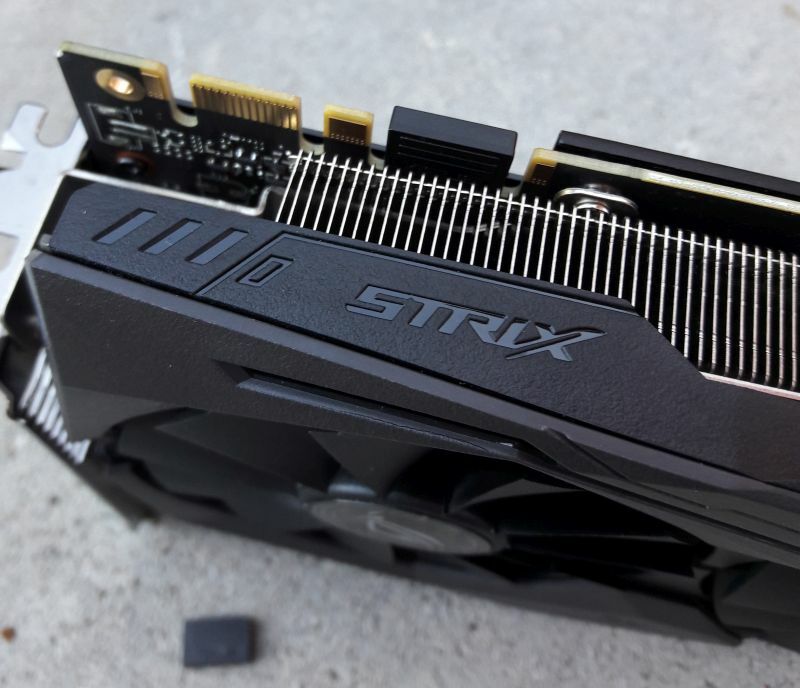 For VR (virtual reality), the Strix GTX 1080 includes two HDMI 2.0 output connectors. 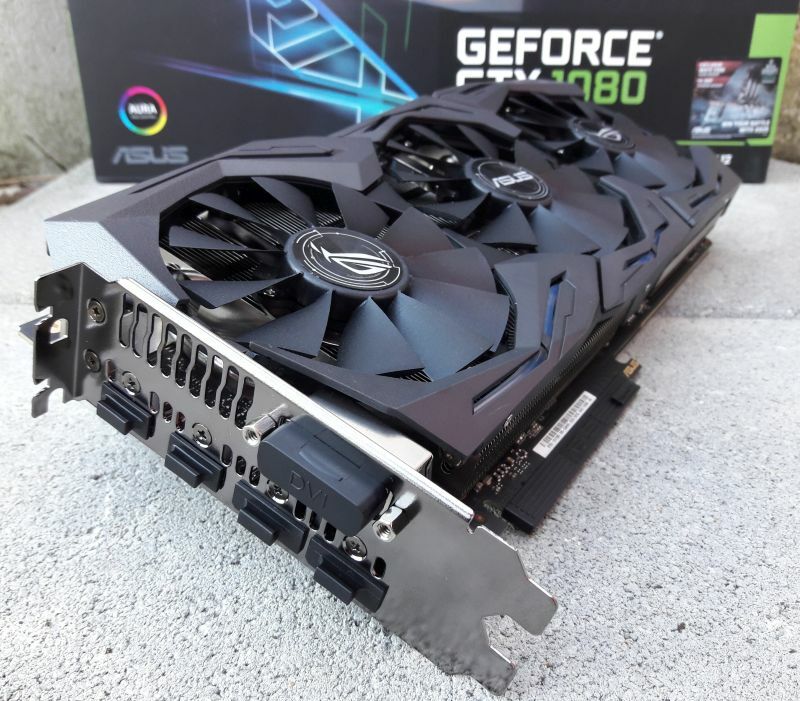 GPU Tweak does not include the functions to control the RGB lighting and you need to download a separate software for that. It only supports 2 Way SLI officially. 3 way and 4 way SLI has been disabled on the driver level by Nvidia. Please correct it. Cheers. Yes 3-way and 4-way are disabled but they are supported if the user has an Enthusiast Key . I update the article. Nvidia officially announced Pascal GP102 TITAN X, 12GB GDDR5X, 480GB/s bandwidth. Hi. I have a 600W real power PSU. 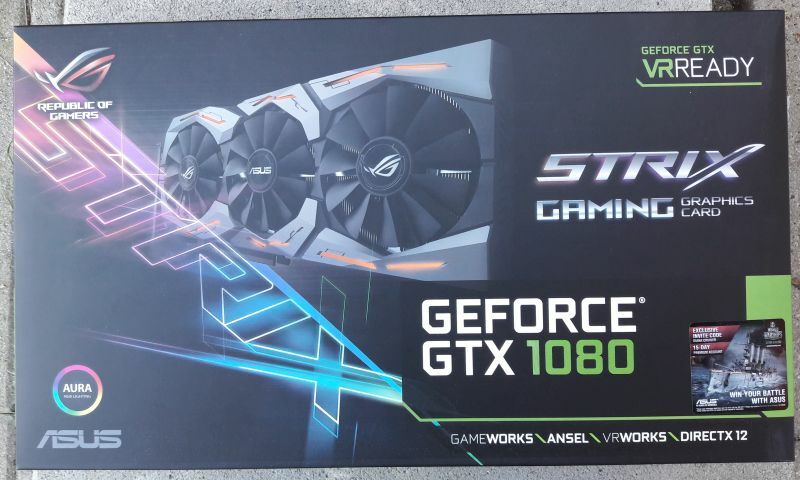 Is safe to use it with this GPU? Thanks.